PetSafe Plastic Dog Doors represent the best in affordable, performance doggie doors. The durable PetSafe Plastic Pet Door gives you and your pet the freedom you both deserve. The soft, flexible, transparent flap is safe and easy for your dog to push open so he can let himself out – and back in. The flap can also keep drafts and insects out of your home. If you want to give your dog the freedom to let themselves in and out, as well as free yourself from the tyranny of door duty, you need a PetSafe Plastic Pet Door. These dog doors will give your dog mobility and control in taking himself out and back in again. These doggie doors are easy to install and install in a wide variety of doors. The plastic pet door frame is tough and durable, withstanding constant use with ease. 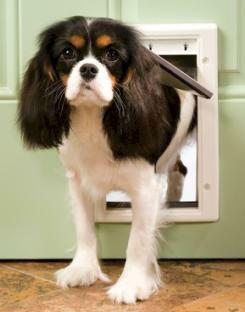 The dog door flap seals securely to insulate and protect your home's temperature. Try a dog door and learn how much more fun owning a dog can be when you don't have to be the one to let them in and out! Your dog will thank your for giving them the ability to go and play whenever they want! Installs on doors from 1/16" to 1-3/4"